Share "Cool Pet Tips for the Dog Days of Summer"
Summer is a great time to enjoy all sorts of outdoor fun, but when temperatures rise too high, conditions can become uncomfortable and even dangerous for pets. Conscientious pet owners, however, can take easy steps to keep their pets cool and safe even on the hottest days. Different pets enjoy different temperatures, and some pets are more sensitive to heat than others. Fish, for example, are more temperature-sensitive and must be kept within an optimum range or they can begin to suffer ill effects very quickly. Many reptiles, such as lizards, tortoises and snakes, often prefer warmer temperatures. Small animals, such as ferrets and rabbits, can be more tolerant of wider temperature ranges, but still suffer in extremes. Very small pets, such as hamsters and gerbils, are more vulnerable to extreme temperatures. Birds are more tolerant of temperature changes than many pets, but still need to be kept at reasonable temperatures to stay healthy and comfortable. Cats and dogs are generally the most adaptable when it comes to changing temperatures, but very high heat can be deadly to them as well. Size – Smaller pets are more susceptible to temperature changes and extremes. Coat Type – Pets with thicker, heavier coats are less able to withstand high temperatures. Age – Very young and very elderly pets are more vulnerable to overheating. Pregnancy – Pregnant or nursing should be protected from temperature extremes. 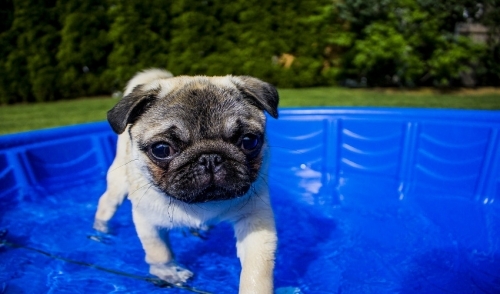 Breed – Flat-faced breeds such as pugs, bulldogs and Persian cats are more vulnerable to heat. Humidity – High humidity levels make it more difficult for pets to cool off efficiently. Activity Level – Pets that are more active will be more stressed as temperatures rise. Overall Health – Pets with severe health conditions can be more at risk on hot days. Every pet will have different reactions to summer heat, and while some pets may be more tolerant of high temperatures than others, pet owners should always take safe steps to help their pets keep cool. Fortunately, there are many easy steps that can help keep any pet cool. During the hottest summer days, several different bowls or drink jars should be available to pets at all times. Adding a splash of low-sodium broth can give the water flavor to encourage pets to drink, and ice cubes can help keep dishes cool and full. Dishes must be cleaned frequently to avoid unpleasant tastes, odors or bacterial growth. Switching part of your pet’s diet from hard food to canned food with a higher moisture content can help keep them hydrated. Be careful to account for their nutritional needs, however, and don’t make excessive changes that can upset their digestion. Mixing water into dry food can be a good alternative as well. Outdoor pet areas should always have some shade available, especially in late afternoon when the temperatures are highest. For indoor pets, check that changing sunlight angles are not taking shade away from cages, tanks or terrariums throughout the summer. Training, play sessions, daily walks and other activities should be scheduled for early morning or late evening during the summer instead of in the middle of the day when the heat is intolerable. Save the afternoon for resting, naps or indoor activities in cooler environments. Try new, cool activities with your pet by adding water to workout or play routines. A kiddie pool can be fun, or let your pet play in sprinklers or use the hose to help keep them cool. Be careful that natural water sources, such as lakes or rivers, are safe before jumping in, however. Allow pets to rest on cooler surfaces during the summer, such as on a tile kitchen or bathroom floor instead of warmer carpet or insulated bedding. Cooling pads can also be used to offer pets a cooler place to rest when temperatures rise. While breezes aren’t as efficient at keeping pets cool as they are for humans, they can still help keep pets comfortable. A ceiling fan can keep a light breeze circulating to help keep pets cool, or pets may find the best places to nap in front of air conditioning vents. When you take your pet out to play, walk or exercise, avoid hot surfaces that can injure their feet, such as sunny asphalt or the hot leather of a car interior. If surfaces cannot be avoided, insulated booties can be a safe and more comfortable alternative. While it is not wise to shave your pet to cope with summer’s heat – their coat is designed to provide insulation from hot as well as cold – thorough grooming can remove loose hair and keep your pet cooler. Long hair can also be carefully trimmed to lighten a pet’s coat. Overweight pets suffer more easily on hot days and are unable to cool themselves as efficiently. By keeping your pet’s weight at an appropriate level and ensuring they are in overall good health, extreme temperatures won’t be quite as bothersome. Even when different steps are taken to keep pets cool, there is always a risk of dehydration, heat stroke or sunstroke. Pet owners should always watch their pets carefully for signs of distress on hot days, particularly reactions like tremors, disorientation, weakness, dry tissues, trouble breathing or rapid heartbeat, any of which could indicate a serious problem. If a pet shows signs of heat-related stress, consult a veterinarian immediately for proper emergency care to cool the animal off safely. Temperatures always rise in the summer, and with them, the risk of heat-related illnesses and emergencies. By taking different steps to keep pets cool, however, pet owners can keep their feathered, furred and scaled friends safe and comfortable even on the hottest days.